Slowly but surely, Bench Mk.II is coming together. 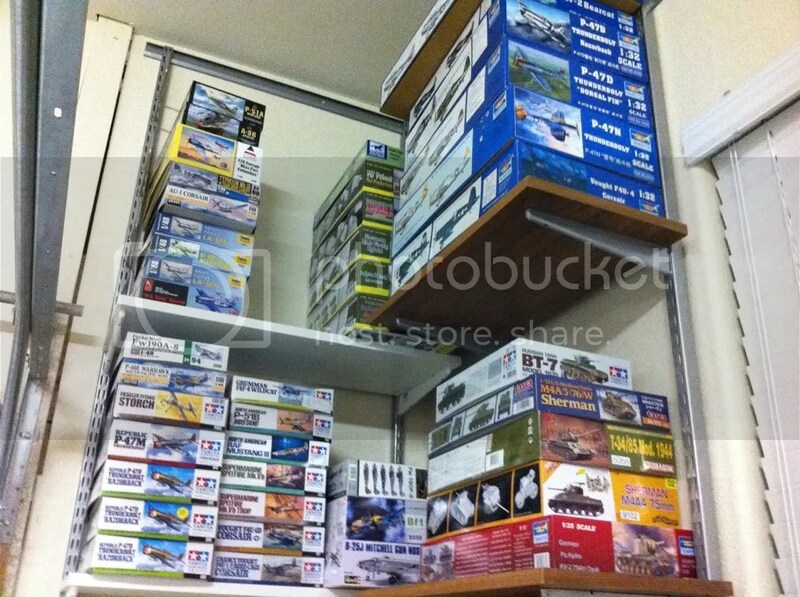 Nearer the bench proper, the paint racks have gone up. These racks, like the shelving, are built from Elfa’s hanging shelf system, and some spice rack baskets. Overall, they’re fantastic, but the thinner paints (Vallejo, Alclad) could certainly benefit from some sort of solid surface to sit on, as they tend to sit a big precariously on the wire. 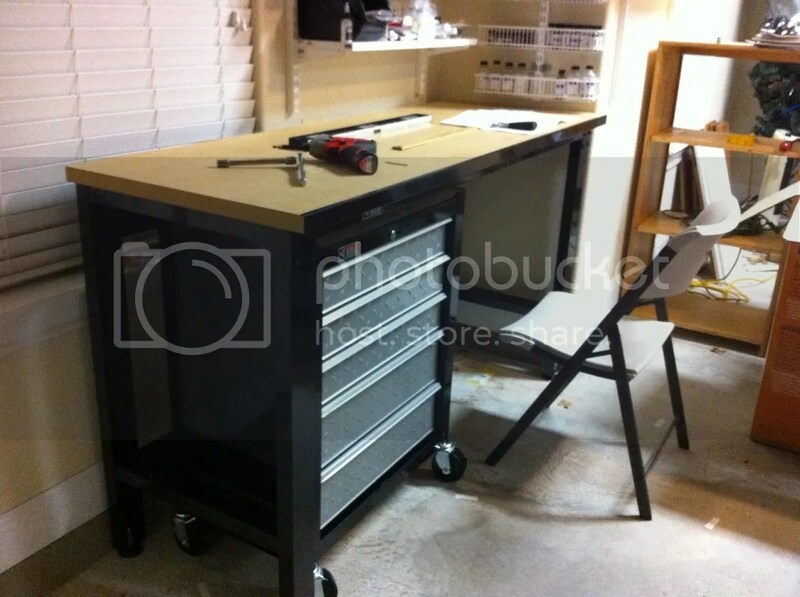 These workbenches are the Gladiator Cadet 6624 – available on Amazon for a fair amount less than many other workbenches out there. Better yet, they’re eligible for Amazon Prime, which means free shipping! Seriously, if you don’t have Amazon Prime, look into it. We’ve transitioned a ton of purchases – diapers, K-cups, etc – over to Amazon because the savings from lower prices + free 2-day shipping are just ridiculous. It even applies to the occasional kit! Got the first bench and the drawer cart squared away last night…first impression…this sucker is BIG. 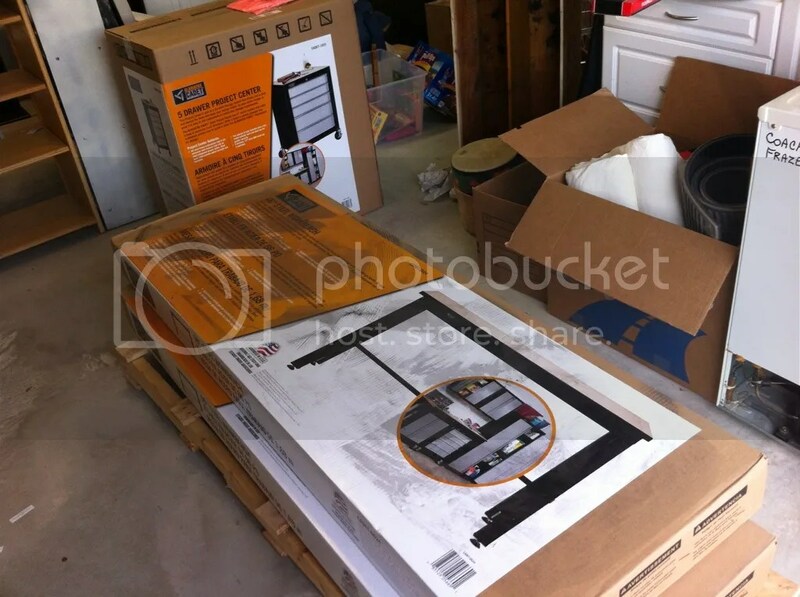 At 24″ deep, it’s the same as the old Costco tables, but that’s where any similarity ends. These benches are 66″ wide to those tables’ 48″, and a whopping 39″ high. They’re tall enough that I could probably work comfortably standing up. Up next – the second bench, a new, taller seating platform, and getting things squared away. I’m still not entirely sure what I’m doing to do for hanging the fluorescent shop light over the paint bench, so I think I may stick with Bench Mk.I’s “there I fixed it” solution until I get a better sense of what I want to do back there. Nice set-up, Doogs ! I checked Amazon & the other vendors listed & was surprised how reasonable that compamies workbenches are.The big reason I’m writing is your mention of hanging Flurescent lights above.I remember Shep Paynes Dio book & him touting the use of Fluro over incandescant lighting.Is there really a benefit ? Keith R.
Yes! I picked up one of those 48″ shop lights earlier this year, and the difference was staggering, especially for painting and airbrushing. 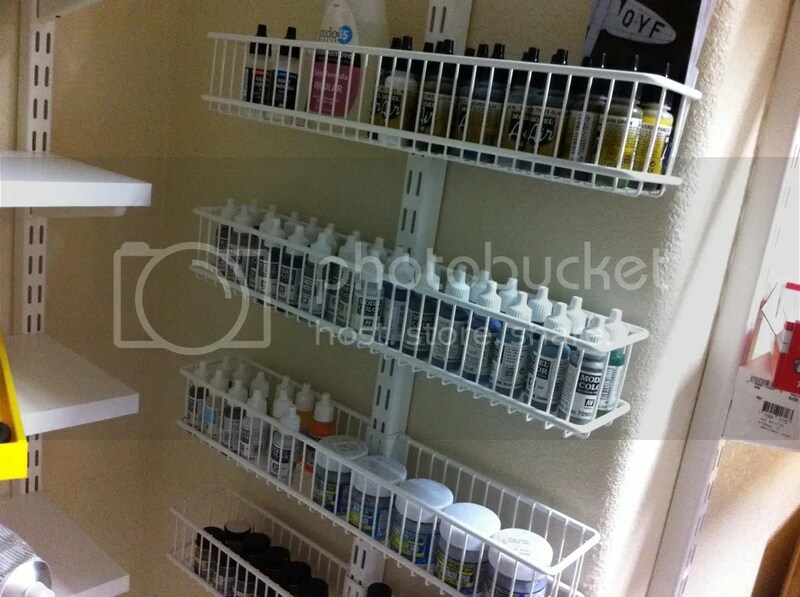 Oe the paint racks, you could get cut a thin board, plastic or cardboard to line the bottom to give the paint a solid base to sit on. You have championed Vallejo Acrylics and I am game to take VA for a spin. Any comments on the Testor’s Model Master Acryl? Will cross the Alclad issues later. Me knows they are lacquer and assumption with have smell/odor issues. Rick – I believe I wrote briefly about acryl in my “No Perfect Paint” post…not a big fan. In my experience, they don’t brush all that well (nowhere near as good as Vallejo or Lifecolor, for certain) and while I’ve gotten them to airbrush decently, they’re very fragile. I’d put them and Lifecolor in the same camp as paints that should not be masked over. I have to say, as I unpack the bench and pull paints out of boxes, the Vallejo definitely has an odor. Or…the Model Air line, at least. But I’ve noticed most acrylics have fairly strong odors even if they’re water-based (Tamiya smells, Hawkeye’s Talon NMF acrylic smells like oranges, etc). They don’t really bother me…but then the only paints that do are Model Master Metalizer and Gunze Mr. Color. As for Alclad…honestly yes it’s lacquer, but the fumes don’t bother me at all. I think maybe because it’s airbrushable direct from the bottle, and I’m very sparing with paint when I airbrush. Especially Alclad, since it’s misted on in successive layers. It also cleans up very easily, and cleanup is usually when I crank the pressure and blow the really harmful chemicals through the brush. So less cleanup = less of that. Thanks for the reply Doogs’. I read your post on paints in your “Gear” tag. You were very clear on the Vallejo, Gunze, Life Color and Alclad. On this piece you covered Testors Model Master Enamel only and wanted some feedback on the Testors MM Acrylic. Yeah, you poo poo’d Tamiya, Talon Acrylic and SnJ Enamel, pretty hard. Not the first time I have heard about that. Thanks again for the data, its very helpful. Looks like I will be loading up on some Vallejo, for starts. Will give Gunze a try later on. When I was building years ago the only paints I would use were Floquil. I mean I was a brand whore. Had their mixing chart etc. Used Floquil for everything, primer, varnish. If the Vallejo brand works for me I may just stick with them. Mined your site and found “No Perfect Paint”. Well done. Many questions have been answered.